Readers who’ve had their fill of dystopian fiction will want to explore these more positive futures. Buy indie! IndieBound, Powell’s or the dropdown below. Or if you must: Amazon. 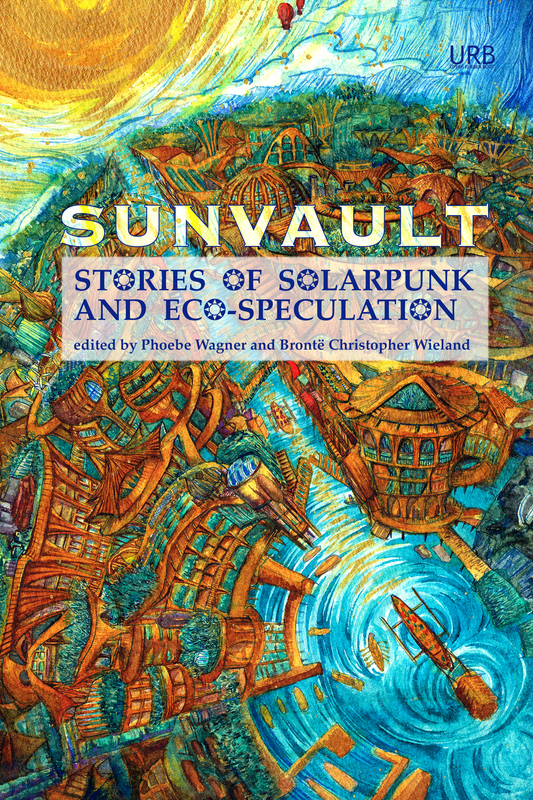 Sunvault: Stories of Solarpunk and Eco-Speculation is the first English-language anthology to broadly collect solarpunk short fiction, artwork, and poetry. A new genre for the 21st Century, solarpunk is a revolution against despair. Focusing on solutions to environmental disasters, solarpunk envisions a future of green, sustainable energy used by societies that value inclusiveness, cooperation, and personal freedom. 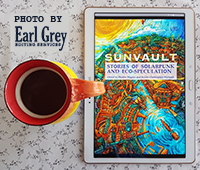 Edited by Phoebe Wagner and Brontë Christopher Wieland, Sunvault focuses on the stories of those inhabiting the crucial moments when great change can be made by people with the right tools; stories of people living during tipping points, and the spaces before and after them; and stories of those who fight to effect change and seek solutions to ecological disruption. Contributors include Elgin Award nominee Kristine Ong Muslim, New York Times bestselling author Daniel José Older, James Tiptree, Jr. Award winner Nisi Shawl, World Fantasy Award and Campbell Award winner Lavie Tidhar, and Lambda Literary Awards finalist A.C. Wise, as well as Jess Barber, Santiago Belluco, Lisa M. Bradley, Chloe N. Clark, Brandon Crilly, Yilun Fan and translator S. Qiouyi Lu, Jaymee Goh, José M. Jimenez, Maura Lydon, Camille Meyers, Lev Mirov, joel nathanael, Clara Ng, Sara Norja, Brandon O’Brien, Jack Pevyhouse, Bethany Powell, C. Samuel Rees, Iona Sharma, Karyn L. Stecyk, Bogi Takács, Aleksei Valentín, T.X. Watson, Nick Wood, and Tyler Young. Phoebe Wagner grew up in Pennsylvania, the third generation to live in the Susquehanna River Valley. She spent her days among the endless hills pretending to be an elf, and, eventually, earned a B.A. in English: Creative Writing from Lycoming College, where she also met her husband. She is an MFA candidate in Creative Writing and Environment at Iowa State University. Follow her on Twitter: @pheebs_w. Brontë Christopher Wieland is an MFA candidate in Creative Writing and Environment at Iowa State University where he thinks about how language, culture, and storytelling shape the world around us. In 2014, he earned his Bachelor’s degree from the University of Wisconsin-Madison in Mathematics and Linguistics. His fiction has appeared in Flash Fiction Online and Hypertext Magazine. Follow him on Twitter: @BeezyAl. Jess Barber lives in Cambridge, MA, where she spends her days (and sometimes nights) building open-source electronics. She is a graduate of the 2015 Clarion Writing Workshop, and her work has recently appeared in Strange Horizons, Lightspeed, and The Year’s Best Science Fiction: Thirty-Second Annual Collection. You can find her online at www.jess-barber.com. Santiago Belluco is a neuroscientist born and raised in Brazil before moving to America to get the usual degrees needed to become a real scientist (namely a funded one). He now lives and works in Switzerland, where he writes speculative fiction and studies the neurocircuitry of vision. Lisa M. Bradley writes speculative poetry and fiction inflected by her Latina heritage. Most recently, her work has appeared in Interfictions, Uncanny Magazine, and Strange Horizons. Her collection of short fiction and poetry is The Haunted Girl (Aqueduct Press 2014). Forged in the scalding heat of South Texas, she now lives in Iowa. She loves horror movies, gothic country music, guerilla art, and art journaling. Chloe N. Clark holds an MFA in Creative Writing & Environment. Her work appears in Abyss & Apex, Bartleby Snopes, Apex, Hobart, Midwestern Gothic, Sleet, and more. She currently writes for Nerds of a Feather and Ploughshares. She can be followed @PintsNCupcakes. An Ottawa teacher by day, Brandon Crilly, has been previously published by On Spec, The 2017 Young Explorer’s Adventure Guide, Third Flatiron Anthologies, and other markets, with an upcoming short story in 49th Parallels: Alternative Canadian Histories and Futures. He was a semi-finalist in the 4th quarter of Writers of the Future 32, contributes regularly to BlackGate.com, and is the Assistant Editorial Director of TEGG Games. You can find Brandon at brandoncrilly.wordpress.com or on Twitter: @B_Crilly. His first TEGG short story, “Wizard-sitting,” is now available at onderemporium.com. Yilun Fan is a PhD student of comparative literature at the University of California, Riverside. She loves reading and writing science fiction because she believes in the power of story. She used to work for the official website of World Chinese Science Fiction Association as an editor and is now a columnist for Science Fiction World magazine. Jaymee Goh is a Malaysian-Chinese writer currently based in California, writing a dissertation on steampunk. Previous publication credits include Strange Horizons, Science Fiction Studies, and more recently recompose magazine. José M. Jimenez is a programmer with the heart of a poet. As Director of Research Information Systems at the University of Iowa, he creates systems that streamline administrative processes so researchers can focus on their projects, not paperwork. His interests include data visualization, workplace diversity and inclusion, geocaching, cooking, and Ingress. He is a proud parent and a beleaguered cat guardian. Likhain is a Filipina artist and writer who works in ink, watercolor, poetry, and odd bits of creative non-fiction. She is a recipient of the 2016 Tiptree Fellowship and has been nominated for the 2017 Hugo Award for Best Fan Artist. A loving albeit wayward daughter of Metro Manila, she now lives in regional Australia with her partner, their pomeranians, and their princess cat. S. Qiouyi Lu is a writer, editor, narrator, and translator; their translation with Ken Liu of “Chimera” by Gu Shi appeared in the March 2016 issue of Clarkesworld. Visit S. online at s.qiouyi.lu or follow them on Twitter at @sqiouyilu. Maura Lydon is a college senior studying Environmental Science with a minor in Creative Writing at Hollins University. You can find her stories in Wings of Renewal: A Solarpunk Dragon Anthology and the online magazine Abyss & Apex. She enjoys writing, reading, and growing as many plants as will fit in her room. Camille Meyers is a writer and wildlife conservation biologist with wanderlust. She has worked with falcons in Belize and as a zookeeper in Washington State. Currently, she is an MFA candidate in Creative Writing & Environment at Iowa State University, where she received the 2014 Pearl Hogrefe Fellowship in Creative Writing. She served as poetry editor for Flyway: Journal of Writing and Environment and volunteers in wildlife rehab at the Iowa Wildlife Center. Lev Mirov is a queer disabled mixed race Filipino-American living in rural Maryland with his spouse Aleksei Valentín. Before he was a published poet, he studied medieval history, magic, and religion. His Rhysling-nominated poetry has appeared in Through the Gate, Liminality Magazine, Strange Horizons, and in other magazines and anthologies, and his speculative fiction has appeared in the anthology Myriad Lands. Canadian illustrator and comic artist Christine Moleski recently graduated from the University of Regina (BA English, BFA Visual Arts). She self-published her first original comic book, ICE, as part of her graduating exhibition. She is interested in the individual human experience and how that experience resonates with humanity as a whole. “Solar Flare” was inspired by cybernetics, i-tech, and clean energy sources. You can find ICE, and more of her work, at www.christinemoleski.com. Kristine Ong Muslim is the author of eight books of fiction and poetry including, most recently, Black Arcadia, Meditations of a Beast, Butterfly Dream, and Age of Blight. She serves as poetry editor of LONTAR: The Journal of Southeast Asian Speculative Fiction and was co-editor with Nalo Hopkinson of the original fiction section of the Lightspeed Magazine special issue People of Colo(u)r Destroy Science Fiction! Widely anthologized and published in magazines, she grew up and continues to live in a rural town in southern Philippines. joel nathanael is a second year MFA candidate in the Creative Writing & Environment program at Iowa State University. His writing interests are in and around the nexus of art and science. He has been given the title of space poet, due to his unrelenting obsession with the subject matter, and where he is often situated, the honorific is apt. While in the MFA program, Joel wishes to further his understanding of poetry through practice. He is currently working on multimedia thesis exploring recursive methods of interpretation of a given source text—space poetry. Clara Ng is a confused snail scooting through life, soon to be a confused snail with a proper degree. Her greatest desire is to be a Renaissance snail, skilled in all the disciplines, but that’s sort of up in the air right now. She has appeared in several university theatre productions, been published in some other small magazines, and is very honored to be included in this anthology. Someday, she hopes to live in a solarpunk world, as one might have guessed. Sara Norja dreams in two languages and has a predilection for tea. Born in England and settled in Helsinki, Finland, she lives for words, dance, and moments of wonder. Her poetry has appeared in venues including Goblin Fruit, Strange Horizons, inkscrawl, Through the Gate, Stone Telling, and Interfictions. Her short fiction has appeared in Strange Horizons, Flash Fiction Online, and the anthology An Alphabet of Embers. She blogs at http://suchwanderings.wordpress.com and can be found on Twitter as @suchwanderings. Writer, performance poet, and performance facilitator Brandon O’Brien is from Trinidad and Tobago. His poetry is published or forthcoming in Control Literary Magazine, Uncanny Magazine, and Strange Horizons, and my prose has been published in New Worlds, Old Ways: Speculative Tales from the Caribbean. He has been shortlisted for the 2014 Alice Yard Prize for Art Writing and the 2014 and 2015 Small Axe Literary Competitions. He currently serves as the poetry editor of FIYAH Magazine. Daniel José Older is the New York Times bestselling author of the Shadowshaper Cypher, including Shadowhouse Fall and Shadowshaper (Scholastic, 2015), a New York Times Notable Book of 2015, which won the International Latino Book Award and was shortlisted for the Kirkus Prize in Young Readers’ Literature, the Andre Norton Award, the Locus, the Mythopoeic Award, and named one of Esquire’s 80 Books Every Person Should Read. He also writes the Bone Street Rumba urban fantasy series from Penguin’s Roc Books. He co-edited the Locus- and World Fantasy-nominated anthology Long Hidden: Speculative Fiction from the Margins of History. You can find his thoughts on writing, read dispatches from his decade-long career as an NYC paramedic, and hear his music at danieljoseolder.net, on Youtube, and @djolder on Twitter. Jack Pevyhouse is a poet and writer with a BA in English and a minor in Creative Writing from UNC Pembroke, where he was the Editor-in-Chief of the student literary magazine, The Aurochs, from August 2015 to December 2016. He is working towards an MFA in Creative Writing from UNC Wilmington. His poetry has been published in the online magazines Paper Crown and Open Thought Vortex. He is also a scriptwriter, an assistant producer, and, in season two, voiced the Fig Wasp King for the award-winning audio drama podcast, Jim Robbie and the Wanderers, available to listen to, for free, on iTunes, Google Play, Podbay, and Stitcher. Bethany Powell’s first published poem was inspired by her hobby of hand-spinning yarn—the literal kind. After a youth of traipsing the US coasts and Japanese inland, she is now based in weird rural Oklahoma. You can find more of her work at http://bethanypowell.com. Sireesha Reddy is currently studying in California, loves to travel, and is really into cultural diversity. She can be found on Tumblr (sirinsquared.tumblr.com) and on Instagram (@sirinsq). C. Samuel Rees has been featured in The Fairy Tale Review, Grimoire Magazine, The Account, Bridge Magazine, Borderlands: Texas Poetry Review, The Matador Review, and JMWW, among others. Most recently he has been anthologized in The Dead Animal Handbook (University of Hell Press) and his poem “Guten Abend, Gute Nacht” was nominated for a Pushcart prize. C. Samuel is an Austin-based educator and poet who subsists on a steady diet of horror films and books on desert/river ecology. Iona Sharma is a writer, lawyer, and linguaphile and the product of more than one country. She’s currently working on her first novel. She can be found at generalist.org.uk/iona and tweeting as @singlecrow. Karyn Stecyk is a writer/editor for an indie video game studio. Her hobbies include rocking out to symphonic and power metal, traveling against the advice of her wallet, eating expensive chocolates, and of course, maxing out her video gaming stats. Bogi Takács is a Hungarian Jewish agender person currently living in the US with eir cheerful neuroatypical family. E writes and edits speculative poetry, fiction, and nonfiction, and eir work has been published in a variety of venues like Clarkesworld, Lightspeed, Apex, and Strange Horizons. Bogi also draws, designs, and typesets things on occasion. If you liked this poem, Bogi recommends the stories “For Your Optimal Hookboarding Experience,” published in Lackington’s, and “Forestspirit, Forestspirit” in Clarkesworld. You can find Bogi at www.prezzey.net and as @bogiperson on Twitter and Instagram. E also reviews SFF at www.bogireadstheworld.com. Lavie Tidhar is the author of the Jerwood Fiction Uncovered Prize winning and Premio Roma nominee A Man Lies Dreaming (2014), the World Fantasy Award winning Osama (2011), and of the critically-acclaimed The Violent Century (2013). His latest novel is Central Station (2016). He is the author of many other novels, novellas, and short stories. Aleksei Valentín is a queer, disabled, Jewish Latinx PhD student by day and writer by night. They live on the outskirts of the Battle of Antietam in Maryland with their husband and fellow writer, Lev Mirov, and two spoiled cats. Currently, they’re working on a Religious Studies dissertation and fitting in time for poetry and paranormal romance. Whenever they escape the library, they can be found scoping out deals on ballet tickets, cooking kosher and gluten-free food, and hunting for the world’s best cup of coffee. Their poetry has previously appeared in Liminality Magazine, and a joint paranormal romance with their husband, The Gods of Small Things, is coming out in early 2017. To see where they’re rolling next, connect with them at https://twitter.com/ai_valentin. Leigh Wallace is an Ottawa writer, artist, and narrator who works as an Access to Information and Privacy analyst for the government of Canada. Her fiction is available or upcoming in Tesseracts 19, Urban Fantasist, and Podcastle, and more of her art is available at leighfive.deviantart.com. This is her first professional art sale. T.X. Watson studies Sci Fi and Fantasy as a form of activism at Hampshire College in Amherst, Mass. Watson has been deeply engaged with solarpunk since late 2014, contributing to the growth of the genre with the Tumblr blog Watsons-Solarpunk, and, later, cofounding Solarpunk Press, a free solarpunk web fiction magazine at solarpunkpress.com. Their hobbies include digital art and binge-watching YouTube videos analyzing popular media. A.C. Wise was born and raised in Montreal and currently lives in the Philadelphia area. Her short fiction has appeared in Clarkesworld, Shimmer, Liminal, and Tor.com, among other places. Her collections, The Ultra Fabulous Glitter Squadron Saves the World Again and The Kissing Booth Girl and Other Stories, are both available from Lethe Press. In addition to her fiction, she coedits Unlikely Story, and contributes a monthly review column to Apex. Find her online at www.acwise.net and on twitter as @ac_wise. South African clinical psychologist Nick Wood has about twenty short stories published in various SFF magazines and anthologies, as well as a YA SF book under the ‘Young Africa’ series entitled The Stone Chameleon, and a recent adult SF novel Azanian Bridges. Tyler Young is a Midwestern lawyer. His work has previously been published in Daily Science Fiction and Nature. When he isn’t writing speculative fiction, he is usually at a zoo or museum with his wife and two young children. and “A Catalogue of Sunlight at the End of the World” by A.C. Wise was chosen for inclusion in The Best Science Fiction of the Year, Volume Three, edited by Neil Clarke. 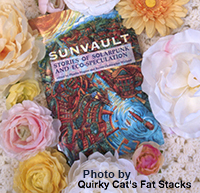 It was very fitting to name this anthology Sunvault, because it was truly a vault of little treasures. A collection of short stories, poems, and even drawings about the sun, plants, water, and different methods to live in peace with our planet. In them, you can find dozens of creative inventions, from solar-powered giraffes to green children. You can find activists who risk their lives and freedom for others, and people who are just trying to live in this world. You can also find the characteristics and people of many different cultures. —Alexa, “Review: Sunvault: Stories of Solarpunk and Eco-Speculation,” A Thousand Worlds, 27 April 2018. Many have called solarpunk naïve and pointless utopia, but there is nothing pointless in dreaming. When we imagine the future as we want it, we concretise it. We take our lofty ideals and make them real, attainable. And solarpunk stories are more than the objective: they are the road map, too. The fights along the way, the hardships as weather-beaten cities reform their means of food production, the struggles of self-sustaining communities shut down by governments who don’t want them off-grid. That is the –punk suffix. It is a rebellion against despair and fatalism, a refusal to accept false universal truths pushed down our throats through a promise to ourselves to create kinder, more hopeful worlds. We can read such stories in anthologies such as Sunvault: Stories of Solarpunk and Eco-Speculation. —Claudie Arseneault, “Constructing a Kinder Future,” Strange Horizons, 23 April 2018. Sometimes, science fiction can feel like it deals mostly in dystopias and other scary versions of the future. Into this darkness, solarpunk shines a ray of hope. The editors of this anthology describe solarpunk as a genre focused on “solutions to environmental disasters,” envisioning “a future of green, sustainable energy used by societies that value inclusiveness, cooperation, and personal freedom.” With stories by authors like Lavie Tidhar, Chloe N. Clark, Nisi Shawl, and Daniel José Older, and gorgeous artwork by Likhain, this anthology is a must-read for anyone feeling beaten down by stories of our grim future. —Maria Haskins, “10 Recent Anthologies That Show Us What SFF Can Do,” Barnes and Noble Blog, 26 April 2018. Politically, the stories vary, but they always feature a progressive focus on race, gender, and equality of all kinds: many revolve around themes of difference, recognition, and acceptance. Non-normativity is often raised to the level of heroism by imagining a world that facilitates the accentuation of one’s abilities precisely because of their difference. Wise encapsulates the feelings of awe and dread that the natural world tends to inspire. —Carly Nairn, “13 Female ‘Cli-Fi’ Writers Who Are Inspiring a Better Future,” Sierra: The national magazine of the Sierra Club, 8 March 2018. There’s not a bad short story or poem between the book’s two covers; editors Phoebe Wagner and Bronte Christopher Wieland certainly did an excellent job in selection and arrangement. . . . If you have any interest at all in science fiction or environmentalism—hell, even if you don’t—do yourself a favour and pick up a copy of Sunvault and check out the budding solarpunk communities online. The selection of short stories is as eclectic and diverse as the authors, drawing from multiple styles and languages. The masterful Daniel José Older, author of the Shadowshaper and Bone Street Rumba fantasy series, contributes “Dust,” a tale of uprising that plays with fluidity of gender and space-opera tropes to tell an ultimately hopeful story. “The Road to the Sea,” by the Israeli author and Campbell Award laureate Lavie Tidhar, is both elegiac and uplifting. “Boston Hearth Project” by T. X. Watson is an action-packed, propulsive story that imagines a near-future Occupy with augmented reality tech. Iona Sharma’s “Eight Cities” explores faith and consciousness against the backdrop of a Delhi inundated by rivers swollen as a result of a changing climate. And “Speechless Love” by Yilun Fan (translated from Mandarin by S. Qiouyi Lu) tells the story of a relationship between two “stratospherians” in a future where “atmosphere colonization replaced space colonization.” . . . The true genius of this work lies in its essence as a community project, as a labor of love by writers, artists and editors. —Paul Daniel Ash, “Book Review: “Sunvault: Stories of Solarpunk and Eco-Speculation,” Hunger Mountain, 27 February 2018. This is one of those books that gave me a real warmth in my heart while reading it. —Michelle Meador, “Sunvault,” 3 January 2018. The best story here is Lavie Tidhar’s “The Road to the Sea”, an autumnal but mutedly lyrical look at a society struggling to survive and put itself back together after most of the world as we know it has been destroyed by catastrophic climate change. Also good is “A Catalogue of Sunlight at the End of the World,” by A.C. Wise, another autumnal story about the people, mostly older folk, who choose to remain behind on an Earth with a rapidly shrinking habitable zone, while their children set off in generation ships to seek refuge out among the stars. . . . So, a number of strong stories and some good reading here, but there’s no real reason why the majority of the stories couldn’t have been published in an ecological/climate change anthology rather than a specifically solarpunk one. —Gardner Dozois, “Gardner Dozois Reviews Sunvault: Stories of Solarpunk and Eco-Speculation, edited by Phoebe Wagner & Brontë Christopher Wieland,” Locus, 2 January 2018.
. . . this was a stand out collection of short fiction. . . . I am much more interested in the eco-punk style of fiction than dystopias because generally there’s more optimism involved with a combination of building, fighting, growing and with a focus on change and transformation generally. That’s definitely true of this collection, and it also makes me think about various things in current society and directions we’re going, turning points we’re approaching, and ones that have passed as well. This is a book not just of stories, but of art and poetry, it’s beautifully curated and this tiny summary does not do the book justice—I highly recommend it. —Ju, “My favourite reads from 2017,” The Conversationalist, 2 January 2018. I feel that the only complaint I can have about this book is that it has left me with a huge hunger for more Solarpunk stories which I know is going to be difficult to fill. Third, in these imagined futures, family structures and genders are rearranged in any number of ways. From children being raised in collectives, to stories without gendered pronouns, to full on gender fluidity, after the end of the world we rely less and less on Christian/American definitions of our most basic relationships. It is key that in these frequently utopian stories, people set their own definitions based on what works for them and allows them to “get the job done.” The “job” is key to Daniel Jose Older’s story, “Dust”. I’ll be honest with you, this story is so good I had to put my e-reader down and walk away. I couldn’t read anything else the rest of the day, I just had to hold parts of the story in my mind. —L. E. H. Light, “Explore Solarpunk SciFi with Sunvault: Stories of Solarpunk and Eco-Speculation,” Black Nerd Problems, 6 October 2017. Standing at the intersection of science and humanities, the book could rightfully be classified as Sci Hum—in the same way the merger of medicine and humanities produced a variety of programs termed Med Hum and Lit Med. —Lanie Tankard, “Eye on the Indies,” 12 September 2017. Contributor Sara Norja talks a little about how she wrote her poem “Sunharvest Triptych” in “Such Wanderings,” 30 August 2017. BW: To me, the root of a -punk genre necessarily needs to be countercultural. In a very basic way, solarpunk responds to and challenges SF and Hollywood’s recent spell of “gritty reboot” stories. More deeply, though, solarpunk manifests a counterculture in the ways that it is community-focused, anti-capitalist, decolonial, inclusive, etc. Solarpunk presents an alternative. Every piece in Sunvault is in some way a response to the artists’ concerns for the world around them and a little nugget of hope. —Sarena Ulibarri, “Interview with the Editors of Sunvault: Stories of Solarpunk and Eco-Speculation,” 29 August 2017. When Brontë Wieland and I started tossing around the idea of editing an anthology together, we were both disillusioned with the dystopian trend in SF. While dystopian worlds and stories offered the opportunity to explore different ideas of destruction and how our current trends in politics, environment, capitalism, globalism, and so on might play out, the stories seemed too hopeless. . . . When I stumbled upon solarpunk through the active Tumblr community, I knew I’d found the positive, inspiring, yet deeply layered genre I wanted to explore. —Phoebe Wagner, “Sunvault: Stories of Solarpunk and Eco-Speculation – Anthology – (Guest Post),” Always Trust In Books, 29 August 2017. The anthology has a brilliant selection of short stories. The Boston Hearth Project by T X Watson, with its Occupy Wall Street meets heist movie vibe is extremely entertaining. Another favourite is Speechless Love by Yilun Fan, which is a truly sapiosexual romance. Eight Cities by Iona Sharma, peppered with Hindi words and set in a drowned Delhi, was a surreal piece. Last Chance by Tyler Young is a beautiful story about choices. The Trees Between by Karyn L Stecyk is another favourite story. It is filled with a hope that made me smile. Boltzmann Brain by Kristine Ong Muslim is another brilliant and chilling piece. The Road to the Sea by Lavie Tidhar, reflects on how human greed pushed things over the edge. The Reset by Jaymee Goh asks us what would happen if there were a reset button that we could push. Solar Child by Camille Meyers takes an intriguing look at how humans may try to push forward their own evolution, and wonders if it will be enough. A Catalogue of Sunlight at the End of The World,by A.C. Wise is a touching story about goodbyes and new beginnings. These are just a handful of my favourites out of the many more excellent short stories in this anthology. —Vijayalakshmi Harish, “Book Review: Sunvault – Stories of Solarpunk and Eco-Speculation,” thereadingdesk, 29 August 2017. I highly recommend it, particularly for those looking to get an overview of this subgenre. —Elizabeth, “Sunvault edited by Phoebe Wagner and Bronte Christopher Wieland,” Earl Grey Editing Services, 28 August 2017. Rating: 5 out of 5 stars . . . While there are many varying ideas on what solarpunk is in this book I never felt like any of the included stories or poems missed the mark. All of them were fascinating to read and offered a refreshing speculative look into climate change, post apocalyptic scenarios, interstellar communities, time travel, and other forms of science fiction. But whatever the situation there often still remains hope for a better and brighter future. . . . This is a must have anthology and a great addition to the solarpunk genre. —”ARC Book Review: Sunvault: Stories of Solarpunk and Eco-Speculation,” Dragon Realm Books, 23 August 2017. PW: I hope readers feel encouraged to become engaged, that it isn’t hopeless. We have a hard road ahead when it comes to climate change and social justice. This summer has seen America pull out of the Paris Climate Agreement, and I’m still sick over the domestic terrorism in Charlottesville. It does not feel like a hopeful time. I hope the stories, poems, and art in Sunvault will encourage small and large actions, encourage resistance, and bring joy. It’s hard not to smile when I look at Likhain’s bright cover. —Christi Craig, “Q&A with the Editors of Sunvault: Stories of Solarpunk and Eco-Speculation,” 23 August 2017. In a time when it’s all too easy to imagine a grim future where corporations and profit are valued over individual people, and hate-speech is given free rein, The Boston Hearth Project offers hope. It is a story of camaraderie, resistance, and working for a greater good, all of which make it an excellent, and timely, starting place for T.X. Watson’s work. —A. C. Wise, review of T.X. Watson’s “The Boston Hearth Project,” “Non-Binary Authors to Read: Where to Start – Part 9,” 22 August 2017. I cannot wait to find out what solarpunk and eco-speculation are all about. And look at that gorgeous cover art by Likhain! —”The SF Bluestocking 2017 Summer Reading List,” 30 June 2017. Every story and poem in this optimistic illustrated anthology of “solarpunk and eco-speculation” portrays a future in which environmental disaster is encroaching on or encompassing our world, but a glimmer of hope remains. . . . Some pieces are bizarre. Many are haunting and will linger in the reader’s memory. Readers who’ve had their fill of dystopian fiction will want to explore these more positive futures. —Publishers Weekly, 19 June 2017.
. . . once again in English, Upper Rubber Boot Books in Nashville will be publishing an anthology entitled Sunvault: Stories of Solarpunk & Eco-Speculation, which has been financed through a Kickstarter campaign that raised an incredible 6000 dollars. —Luca Albani, “Solarpunk, the First Anthologies Published and Those in Progress,” Medium, 16 May 2017. I put in Proulx’s hand something she was in no position to offer me: hope. Specifically, I gave her a postcard for an anthology called Sunvault, a book of “solarpunk” stories postulating a future in which we overcome our species’ doom. Solarpunk, aka “ecospec,” aka “cli-fi,” is a subgenre of SFFH confronting the looming threats of melting ice caps, rapidly rising oceans, monster storms, and the thousand other slings and arrows of climatic catastrophe. —Nisi Shawl, “Future Alternative Past: hope for the ecospec-future,” The Seattle Review of Books, 11 May 2017. There’s a lot of discussion about what solarpunk is or isn’t, but the truth is there just hasn’t been enough written to set the tropes and expectations yet. Some of what has been called “climate fiction” could be called solarpunk as well, if it presents an optimistic view of the future (which much of it does not). —Sarena Ulibarri, “Cover Reveal: Sunvault: Stories of Solarpunk and Eco-Speculation,” 26 April 2017. Some stories are so unique I couldn’t imagine them on the page until I read them. Others deal with solarpunk in a more straight forward manner. Overall, reading how writers and artists interpreted solarpunk was invigorating. —Michael J. DeLuca, “Reckoning Interviews: Phoebe Wagner, Editor of Sunvault,” Reckoning: An annual journal of creative writing on environmental justice, 27 October 2016. Solarpunk is a movement that considers what a sustainable, environmentally-ethical society could look like. It spans from science to religion, from social problems to sustainability, with a focus on ingenuity and community. Obviously, this description is pretty far off from most societies around the globe, so that’s what makes it a true –punk movement. While solarpunk might not be chaotic, it is countercultural. When it comes to the literary genre, solarpunk is still largely undefined, and we hope Sunvault might give shape to the genre. —from “Interview with the Editors of Sunvault: Phoebe Wagner and Bronte Wieland,” nerds of a feather, flock together, 27 April 2016. BW: Solarpunk, at its core, is about a future, or an idea, of ingenuity in clean energy and sustainability. Especially with that idea of counterculture and community, as I mentioned above. Eco-speculation inspects the way we interact with, and change, our environment, and what effects that will have in the future. It’s the way we experiment recklessly with our surroundings like we would never be able to experiment on subjects that were visibly mortal. It’s about the ways we are careful too, and how we try to protect and defend the world around us. —Chloe N. Clark, “S2/ E5: Eclipsing, an interview with the editors of Sunvault, Part 1,” Luna Station Quarterly, 11 March 2016.